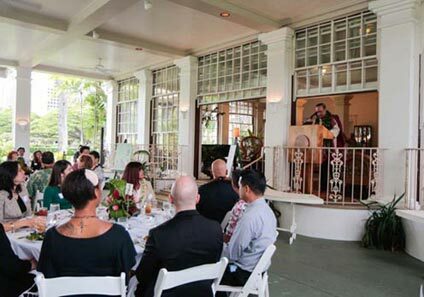 (January 27, 2014) In celebration of Goodwill Industries of Hawaii’s 55th Anniversary, Kahu Wendell Silva senior pastor of the Aloha O Kalani Ministry, had the honor of offering the invocation at a luncheon hosted at Washington Place, the historic residence of Hawai`i’s Governors. Inspired to share the spiritual and cultural significance of the word “goodwill” as expressed in the context of the traditional Hawaiian value of lokomaika`i, Kahu explained to guests the literal meanings of the root words loko (within) and maika`i (goodness) and how it’s through the spirit of the goodness within as demonstrated by the qualities of kindheartedness, compassion, generosity and benevolence, that Goodwill Industries Hawai`i has helped thousands of people to attain their potential and become self-sufficient. Kahu acknowledged Goodwill Industries of Hawai`i’s training, education, career development, job placement programs and support services as valuable contributions and prayed for their continued success. He extended a very warm mahalo (thank you) to all of the dedicated individuals who have helped to perpetuate the Hawaiian value of lokomaika`i in their services to the community. 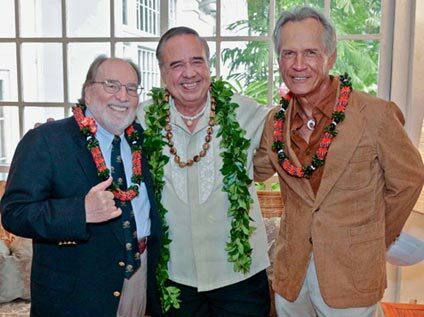 Starting with a hug from Governor Abercrombie and greetings from Senator Brickwood Galuteria, Kahu was glad to see friends and associates from the state and the legislature whom he worked with during his tenure as the executive director of the State Foundation on Culture and the Arts. Kimo Kahoano invited Kahu to be on his morning radio show to talk about his new book, Nā Hō`ailona Hānau which is about the unique topic of Hawaiian lunar birth signs. The book and companion audiobook will be officially launched at a presentation and book signing at Hilo Hattie’s. Kahu Silva extends a special mahalo a nui loa to Goodwill Industries Hawai`i for the opportunity to be of service to them and especially to Rick Kuwahara for his help, for sharing photos.